Chiropractic care is a proven method to affect overall nervous system function and health, without the need for invasive procedure or medications. Through correct alignment of the spine, it grants the nervous system to reach its full potential, every member of the family can achieve optimal health. Chiropractic care is proven safe and effective for every age group, from infants to the elderly. Regular chiropractic care can be an effective form of healthcare that can reduce dependence on prescription drugs, alleviate the symptoms of a variety of ailments, and boost energy. 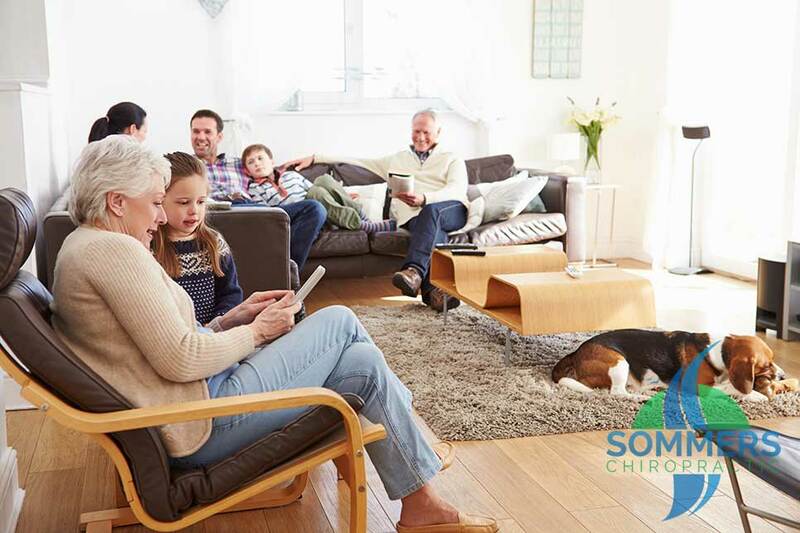 At Sommers Chiropractic, we want to see your entire family live a full, healthy life, and inspire others in South Burlington. Like adults, a child undergoes a great deal of stress on their spine. Regular playtime activities, youth athletics, or just rough housing can put their spine out of alignment and affect their nervous system function. With regular pediatric chiropractic care, a child can keep their spine in ideal alignment, no matter what may come. Through excellent spinal health and optimum nervous system function children will have improved sleep, fewer behavior problems, and better overall development. Regular pediatric chiropractic care is perfectly safe for developing children and recommended to keep them at the peak of health. Pediatric Chiropractic care for children as they age creates a solid foundation of continued health and nervous system function that will lead to better growth, healthier development, and an improved life. Like adults, a child undergoes a great deal of stress on their spine. Regular playtime activities, youth athletics, or just rough housing can put their spine out of alignment and affect their nervous system function. With regular care at Sommers Chiropractic, a child can keep their spine in ideal alignment, no matter what may come. Through excellent spinal health and optimum nervous system function children will have improved sleep, fewer behavior problems, and better overall development. Regular chiropractic care is perfectly safe for developing children and recommended to keep them at the peak of health. As we age, our bodies begin to break down. As the spine begins to degenerate, the cartilage between each vertebra becomes worn due to long-term spinal misalignment, and may lead to nervous system dysfunction. Through regular geriatric chiropractic care, the elderly can help mitigate many of the symptoms common to growing older and live a healthier life. They will see greater mobility, allowing them to live on their own safely and for a longer period of time. This will keep them out of the nursing home and close to the people that love them. Geriatric chiropractic care serves to provide longevity and energy by correcting any misalignment in order to keep the nervous system functioning at its best possible performance. Through regular geriatric chiropractic care, patients can see a decrease in dependence on prescription drugs, an increase in energy, and the occurrence of fewer health problems. As we age, our bodies begin to break down. As the spine begins to degenerate, the cartilage between each vertebra becomes worn due to long-term spinal misalignment, and may lead to nervous system dysfunction. Through regular chiropractic care, the elderly can help mitigate many of the symptoms common to growing older and live a healthier life. They will see greater mobility, allowing them to live on their own safely and for a longer period of time. This will keep them out of the nursing home and close to the people that love them. Geriatric chiropractic care serves to provide longevity and energy by correcting any misalignment in order to keep the nervous system functioning at its best possible performance. Through regular geriatric chiropractic care for seniors in South Burlington, patients may see a lesser dependence on prescription drugs, an increase in energy, and the occurrence of fewer health problems. It is Dr. Michael Sommers’s mission to take care of all ages in the South Burlington community.